In my ongoing exploration of analog photography I've dabbled with 120 format before, but not really to the extent that I've done 135 format, so I figured it was time to "remedy" that. 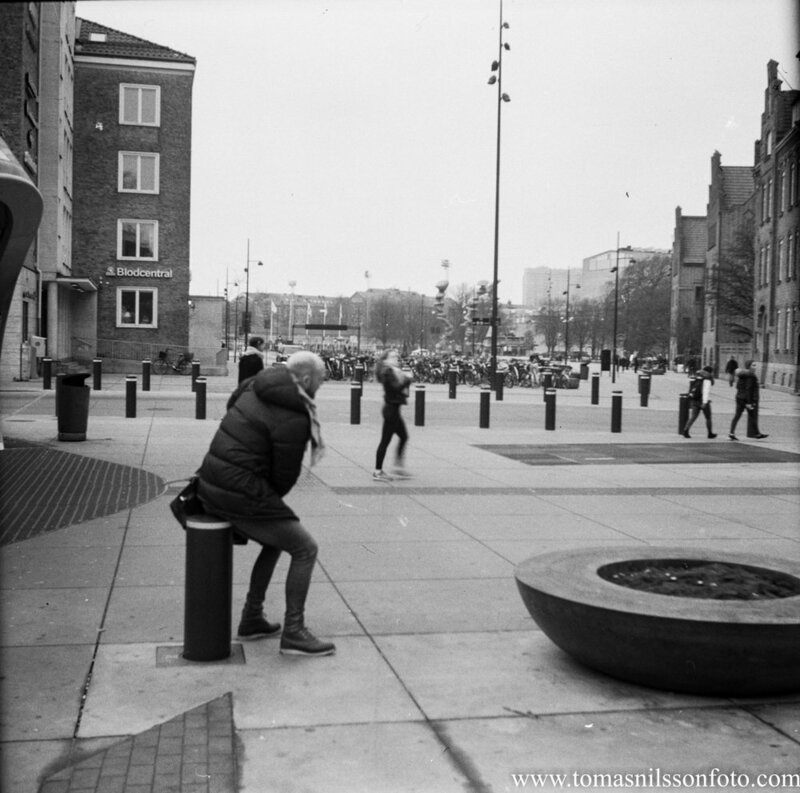 I picked up a 5-pack of Tri-X 400 film at the local camera store and put a roll into my father's old Zeiss Ikon Nettar from 1957 that I've temporarily appropriated for my usage. It's a VERY analog camera where you have to do ALL the settings yourself; the camera gives you no assistance whatsoever. Whatever happens is up to the photographer. Sadly that's where this became blatantly obvious...at least this time around! The errors were not in the camera or the film - they were in the man behind the lens. I wasn't successful in judging the distance to my subjects, so several of these shots are out of focus to a degree that I can't even begin to claim as "artistic". Still, it was fun doing them during the most recent monthly photographers' brunch and photowalk. 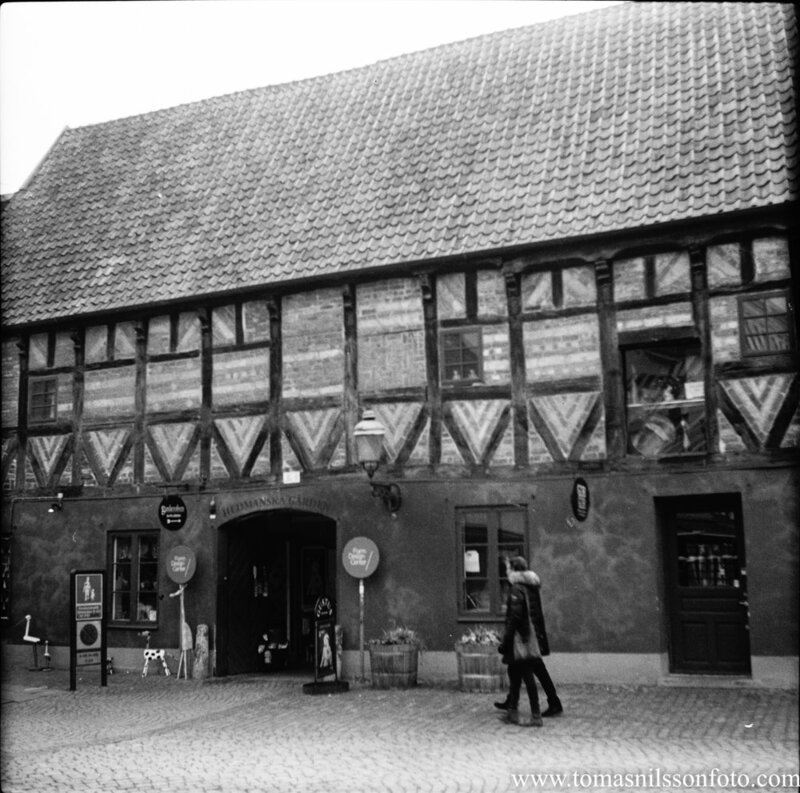 I garnered quite a few looks as I shot with the ancient (almost anyway) camera in the streets of Malmö! Some of the other photographers taking pictures of a Bronica camera which was not quite as old as mine (early 1970s). It was enjoyable to leave the computer behind and walk the streets in search of things and people to photograph...even though I've seen the places so many times. I've not done so much photography with actual cameras (other than the cell phone) lately, so I was glad to haul my shoulder bag, laden with gear, into town. It did feel a bit different this time since I was using cameras that I'm still not entirely familiar with, like the "new" Canon 650 SLR from 1987 that I'm familiarizing myself with. I'll share pics from the first rolls of that camera in a later blog post. Still a bit too cold for me to sit outside for my coffee! A house that's "slightly" older than the camera I used that day.